Mountaintops are harsh places, and plants and animals living there face many challenges. The short growing season between the late spring melt and the early fall snowfalls makes it difficult to complete lifecycles. High elevations are exposed to intense ultraviolet light, which can damage living tissues. The frequent winds cause damage by drying and by abrasion with sand, silt or ice crystals. Plants and animals have evolved ways to cope with these stresses. Setchell's Willow, Tatshenshini River. David Fraser. 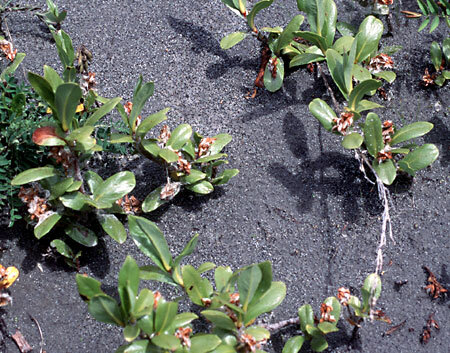 Some plant species, such as Setchell's Willow, grow low to the ground, spreading by underground stems. A thick waxy coating protects the leaves from the drying winds and abrasive windblown sand and silt. Other plants cope with desiccating winds by producing hairy stems or leaves. 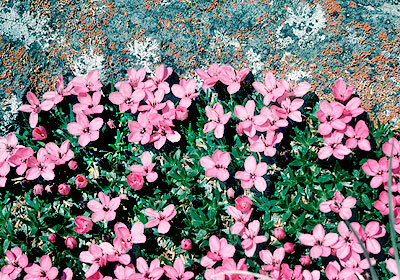 Moss Campion huddles low to the ground on alpine gravel. Robert Cannings. Lichen on rock. Robert Cannings. Nutrients are often scarce on mountains. Wind brings much-needed nutrients to some plants. 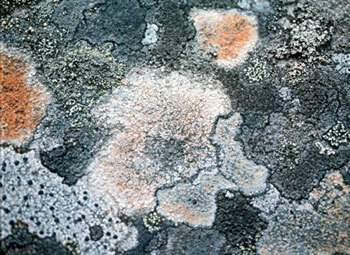 Mosses and lichens use windblown nutrients extensively, and patches of moss are able to establish even on the ice of the glaciers.